Elcometer 456 Model T Ferrous Separate Coating Thickness Gauge with standard separate probe; 0- 1500µm. Gauges have memory which can store up to 150,000 b readings and Bluetooth® technology for cable free data transfer and are compatible with ElcoMaster® Data Management Software, ideal for creating detailed, professional reports. ElcoMaster® Data Management Software for Android™ can also be used to transfer readings from Elcometer Bluetooth inspection gauges straight to smart phones and tablets running Android 2.1 or above, allowing data analysis immediately on site, without having to turn on a computer. Click here if you are wanting the more simple Basic Digital Inspection Kit with entry level gauges that do not connect to ElcoMaster. o Space in kit to fit, but not supplied. Order separately if required. Climatic conditions using the Elcometer 319 Dewpoint Meter:The Elcometer 319 has been designed to incorporate all the features required for climate condition monitoring in a single gauge with memory and measurement options which make this one of the most versatile digital dewpoint meters available.The clear, illuminated display can show any combination of up to five climatic parameters including: % Relative Humidity, Specific Humidity, Surface Temperature, Ambient Air Temperature, Dewpoint Temperature, Delta T, Dry Bulb Temperature and Wet Bulb Temperature.The Standard Gauge has a 10 reading rolling memory whereas the Top Gauge can store up to 40,000 sets of readings in 999 batches. It also offers USB data output and Bluetooth wireless technology for cable free data transfer. Used in conjunction with ElcoMaster™ 2.0 software readings can be stored and used to create professional reports. Surface profile using the Elcometer 224 Digital Surface Profile Gauge:The Elcometer 224 provides the very latest in surface profile measuring technology. 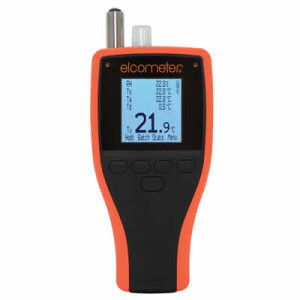 Accurate, fast and very user friendly, the Elcometer 224 Model B displays statistical values as readings are taken. 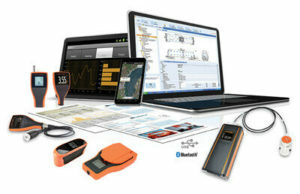 The Model T has the advantage of a large built-in memory to accurately record up to 150,000 readings in 2,500 batches. 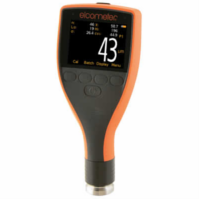 Dry film thickness using the Elcometer 456 Digital Coating Thickness Gauge:The new Elcometer 456 Coating Thickness Gauge sets new standards making measuring dry film thickness faster, reliable and accurate; helping you to become more efficient. 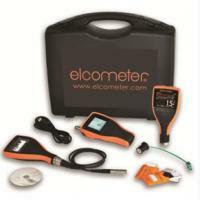 Elcometer have designed a series of data management software packages that will link directly with the data collection devices (gauges) and instantly produce professional reports, offering full traceability of the inspection proving compliance to the relevant standard being followed.Our free software package, ElcoMaster® is the most flexible data management software on the market. Designed to meet the demanding needs of the quality inspector whilst offering the ultimate flexibility for managing data into ‘projects’ for ease of use.